Anodot helps you find and fix issues before they impact users, driving improved customer satisfaction, reduced churn and increased revenues. Marketing, product, customer service, support, finance (payments) and operations (fulfillment) are the crucial links in the chain creating an outstanding customer experience. A critical issue in any of the links breaks the chain, immediately impacting usage, revenues and reputation. 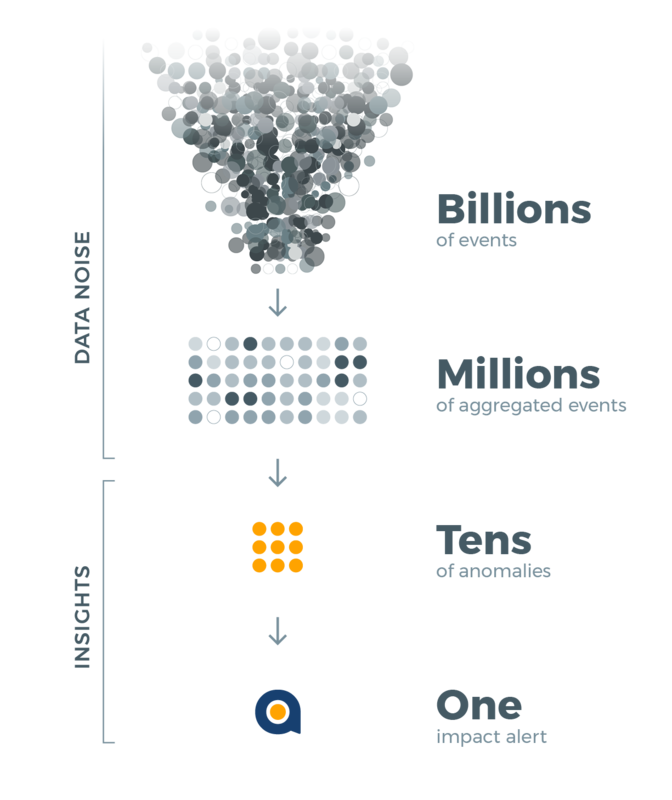 Anodot constantly monitors IT, product and business metrics from multiple data sources; identifies baselines; eliminates noise and false positives; and alerts you to the only anomalies that matter. Usage lapses across the customer journey will happen, whether via product versions or permutational complexities. Reacting to them before they impact users is the key to providing a seamless experience. Anodot’s patented correlation engine clearly maps out related metrics and events for a holistic understanding of the problem and how to fix it, significantly reducing time to detect and resolve. 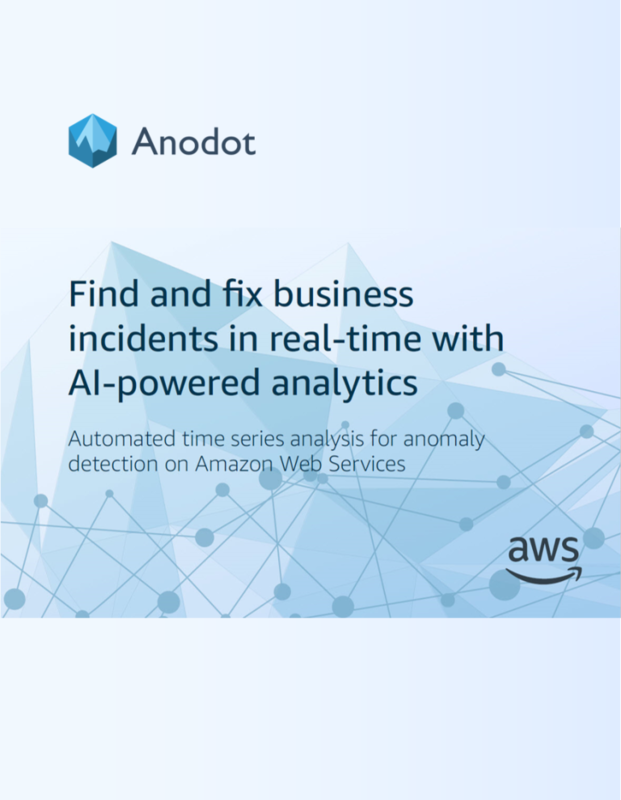 Whether you’re up against a faulty version release, a DDOS attack or a customer support process change that backfires - Anodot’s customer experience analytics will alert you to the anomaly and cause faster than is humanly possible. 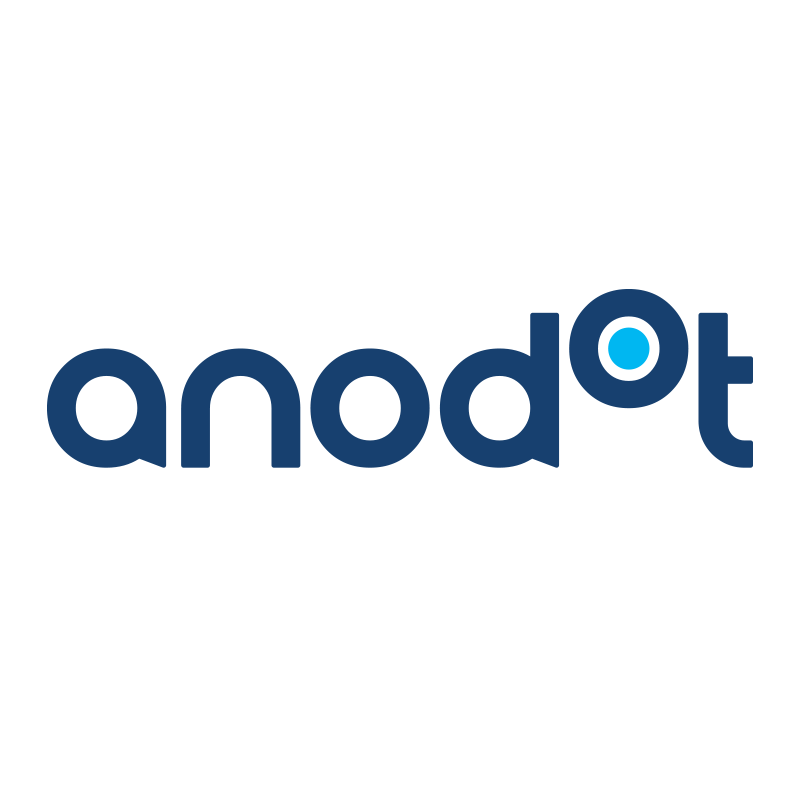 Anodot surfaces anomalous behavior in usage patterns, conversion and spending rates, retention and churn, to uncover where the company can improve and to anticipate areas ripe for growth. 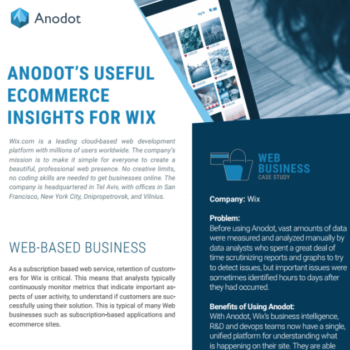 By monitoring all customer metrics - from awareness to acquisition, retention, upsell/cross sell and advocacy - Anodot supports marketers and product managers in optimizing interactions across touchpoints. This approach supports a faultless customer experience that translates into conversions, loyalty and revenue. WHERE DID MY REPEAT BUYERS GO?! A large online business launched a campaign to convert first time buyers to their second purchase. Just as the campaign started to gain traction, Anodot detected a drop in repeat buyers from this specific state. 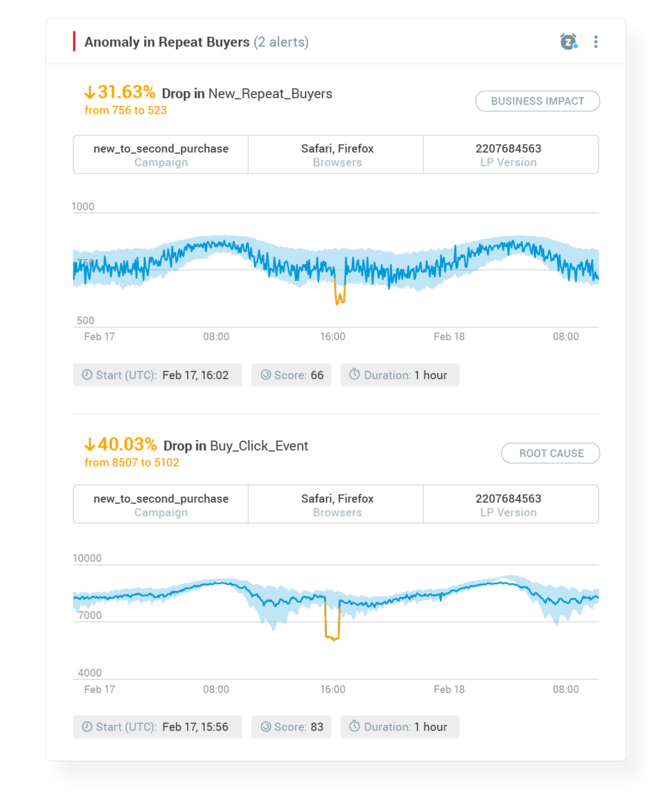 The platform then correlated the anomaly with another event - the “Buy Now” button had become unresponsive in specific browsers (Safari and Firefox) due to a new version release. Anodot’s alert and root cause analysis (TTD=1 hour) enabled a quick fix that put the campaign back on track. 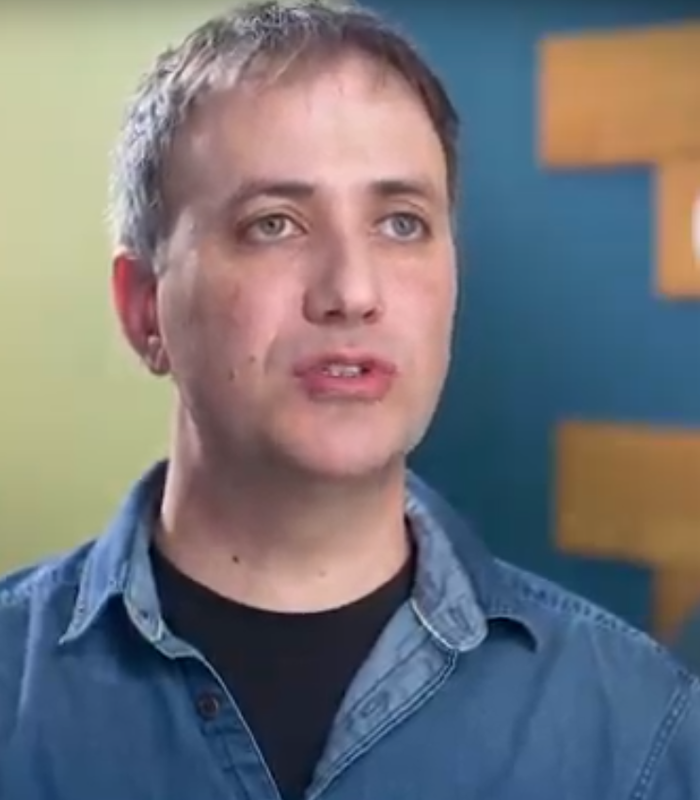 Wix needed a real-time alert system that would indicate issues without manual threshold settings in the key metrics. 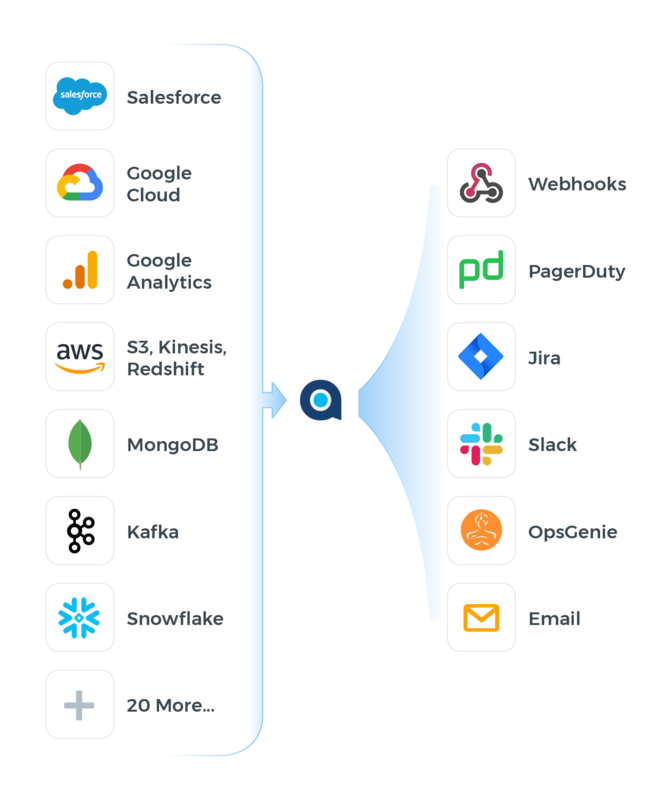 Anodot is a full-service AI platform that monitors your data at a highly granular level - 24/7. Rest assured that if anything important happens, we will reach out. The holistic platform collects data across all systems and touchpoints to eliminate blind spots and shorten root cause investigation. 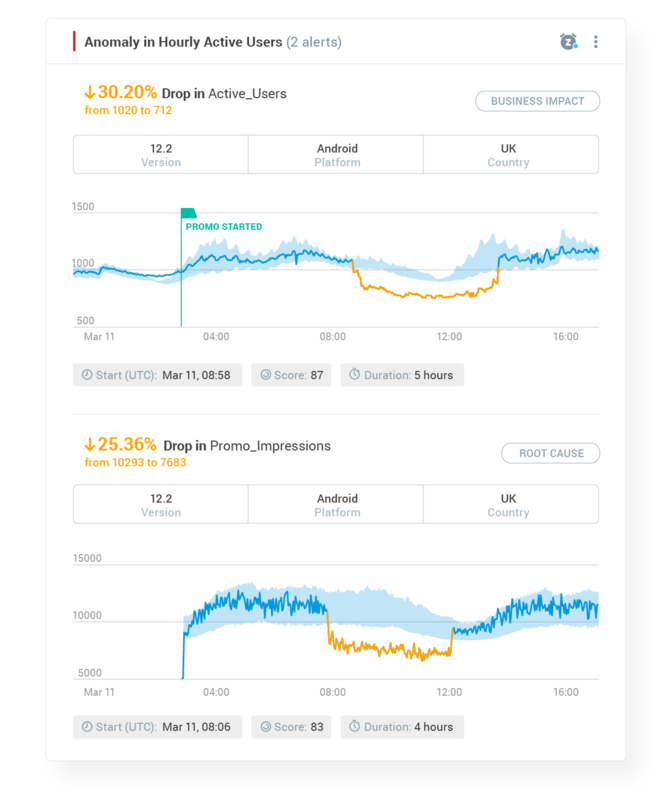 Anodot monitors your metrics in real time and notifies you before issues become an issue. An intuitive interface and completely self-service UX finally puts the power of AI at your fingertips. 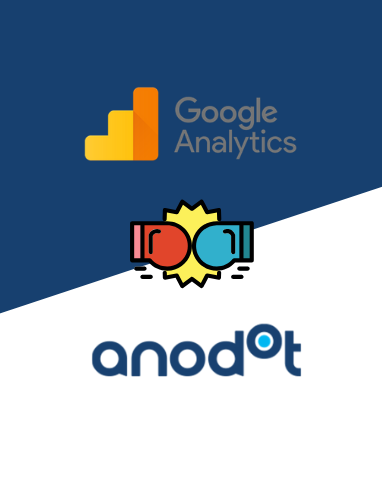 Google Analytics vs. Anodot: Which Anomaly Detection Proved More Intelligent? You Can Improve Your Customer Satisfaction Charlie Brown!